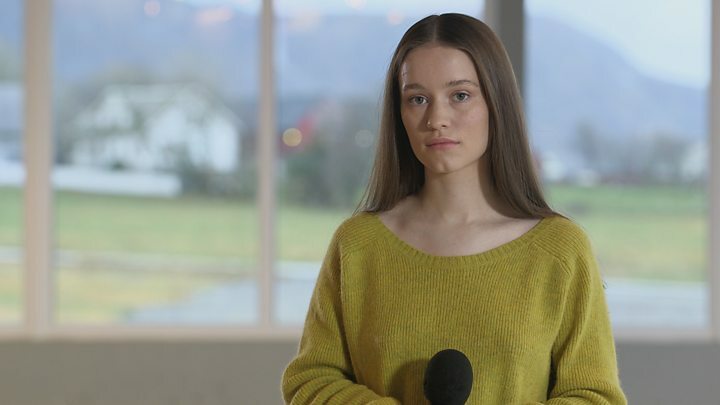 Image caption "My vision is to make interesting pop music that has a nerve to it"
"Writing a good pop tune is difficult," says Sigrid, the Norwegian pop star who's just won the BBC's Sound of 2018. "It's a challenge, but it's a good one - and when you find that one brilliant hook, it's the best feeling." The 21-year-old only started writing music four years ago, when her brother - who's also a musician - invited her to play a show with him, on the condition she stopped playing Adele covers. "I guess he figured out I had something in me, and I just needed that little push," she told the BBC earlier this year. The then-teenager's first song, Sun, was playlisted on Norway's national radio station and, after a brief break to finish school, her next set of demos sparked a record label bidding war. Media captionSigrid tells us about her childhood and performs a rare acoustic version of Strangers. Island Records got the gig after pursuing the singer around Bergen; and launched Sigrid's international career with last year's exuberant and kooky and charismatic Don't Kill My Vibe EP. The title track is her calling card. Inspired by a disastrous recording session in London where older, male producers patronised and demoralised her, it's a defiantly upbeat anthem to her own strength. It's given her the opportunity to play around the world; bowling over audiences with her charismatically uninhibited performances (she is, to put it mildly, from the Lorde school of dancing). 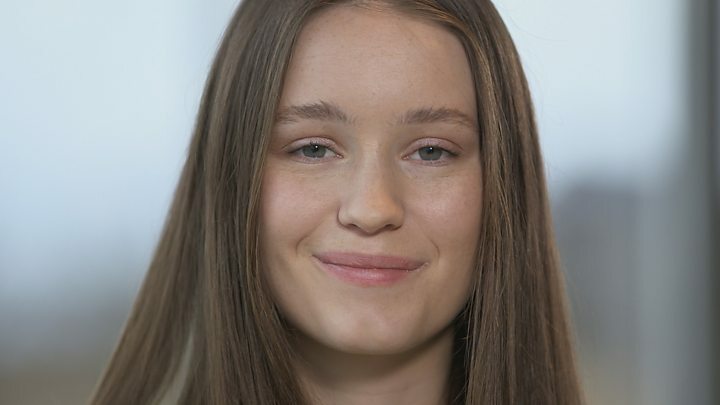 Immediately after being told she'd won the Sound of 2018, Sigrid sat down with BBC News to discuss circuses, socks and the elusive quest for a perfect pop song. Congratulations on winning the Sound of 2018! How does it feel? I'm really honoured. I just want to swear a lot, but I know I can't do that on the BBC so I'm trying to hold it in! Previous winners include Adele, Sam Smith and Ellie Goulding. What does it mean to be in their company? Adele's one of my favourite artists! It's huge and I don't think I'm going to understand how big it is until I walk out of this room. Is it true that the first time you sang in public was at a sort of home-made circus? Haha! Yes! That was at my grandparents' cabin, which is situated in a bay 20 minutes from our house in Alesund. The children arranged a circus and we took money for people to come, which we spent on an inflatable dragon we could play on in the sea. A Norwegian song called Steinrøysa Neri Bakken by Alf Prøysen - it's like a traditional, old-school song. Image caption "Music has been a big part of my life ever since my mother started singing good night songs for us and my dad helped me learn how to play the guitar." Was that the moment you decided to be a singer? That took quite a while, I think. I was a very shy kid. Very shy. But I started doing theatre when I was six years old and that really changed something. My more playful side came out of me. Then, when I was in junior high I started doing covers - Ellie Goulding, Adele, Coldplay, Keane - and I would change the rhythm or the melody to make it my own. That's when I discovered I like to make stuff, not just copy it. Then your first original song got picked up by the Norwegian equivalent of BBC Introducing. That was a big moment for me. It was the first time someone told me I made cool stuff outside of my school. But the thing was, I was very torn about what I wanted to do. I had a record contract, but I took a small break from releasing music because I wanted to finish school. At that point, I wanted to become a lawyer. I wanted to become a politics teacher. I had a lot of ideas about what I wanted to do! Didn't you end up studying politics? For two months! It was a three-year degree, but I only had the introduction. I'm very glad I quit. But I want to study some day. Maybe after my third album I'll just go to Uni. That would be really cool. Can you tell me about the recording session that inspired Don't Kill My Vibe? What did they do to you? Just some mean comments. I'm not sure if I want to go that deep into it. Anyway, the song isn't about me being a diva going, "Oh, you don't respect me." It's just like, "Just be polite and nice. That's all I'm asking for." You write principally on the piano. Why that instrument in particular? You can get so many moods out of it. The whole spectrum of emotions. [Getting up to play] This is my favourite chord - an F Major 7. It's so bittersweet. The piano really comes to the fore on Dynamite - which I've heard people compare to Adele's Someone Like You. What was going through your mind when you recorded that? I was trying to be as sad as possible. Like, on the brink of crying. We did it in one take. A lot of your other songs take negative emotions and turn them into something empowering. Did you set that goal when you went into the studio? Not necessarily when I go into the studio. Maybe an hour into the session we settle our goal for the day. But I always have a bigger vision, yes. And my vision is to make interesting pop music that has a nerve to it, that is catchy, that has a sense of humour. Is there something about Scandinavian pop that makes it stand out to British ears? Definitely my accent! My accent is weird. When I listen to some of the words I'm pronouncing in Don't Kill My Vibe, I think I could have been better! Even today, I feel like my English is terrible. I haven't been speaking English over Christmas. But I think the Scandi "thing" is very intricate melodies. English is our second language, and that creates a barrier where you have to concentrate on the melody. Because of that, I guess there's a history of making good vocal hooks - and that makes good pop music. There's a great moment on your latest single, Strangers, where you suddenly go "whoop!" in the middle of the chorus. How did that come about? I don't know! I just think it's a funny sound. I like to be dramatic in my music because that's when it gets to your heart. You want to have that nerve to it. But I also love to mix in humorous stuff like the "whoop" because it loosens it up and makes it interesting. Are you always looking for that magic ingredient? Oh yes! In every song. That's my favourite quest. I love getting into a single line and spending an hour on it. It's fascinating. It's like a treasure hunt. What's been the highlight of being a pop star so far? The coolest thing we've had on our rider has been woollen socks. That happened once in Norway and I've never been as happy! Media captionSigrid performs Raw in Oygardshallen, Giske, Norway, close to where she grew up. There's a merchandising opportunity for you: Sigrid socks! We actually have socks! For the EP, the creative team at Island came up with the idea of having a Don't Kill My Vibe t-shirt, and then a Plot Twist scarf, Fake Friends socks and a Dynamite polo sweater. And they're all real garments. How will you keep that going? Will single number 40 be the Sigrid meat dress? Ha! That would be really cool. Finally, how close are you to finishing your album? The thing is, I want to be a bit secretive about it, if that's alright? It's important to me that when I release it, I'm going to release it because it's finished. Not because it's expected to be out. But I'm aiming for 2018. It's very exciting!